Captures text that you write with a special digital pen, and translates it to ASCII text using proprietary optical character recognition technology. Making changes is easy—E-Pen&Write transfers your notes and drawings in the same order as they appear on your paper, so you can add text or lines later. Transforms your handwritten notes into your own text so the data can be used, stored, edited and manipulated simply and easily! 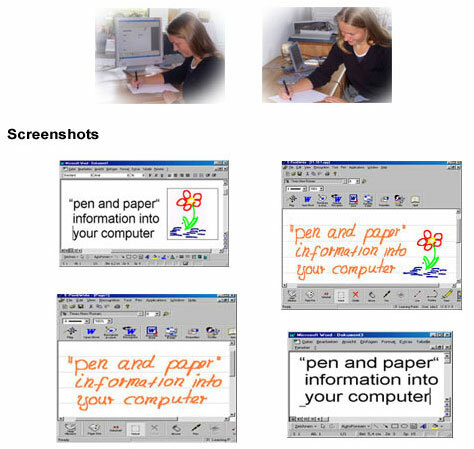 Captures written text with a special digital pen or tablet PC and translates it to ASCII text. Reproduces text and design data within the context of your graphic and stationery formats, such as design documents, company letterheads, organizers, notepads, business cards and digital notepads. Your company's customization is performed automatically. Reads handwritten and cursive text without a learning curve, saving training time and money. Text-ordering & Text Formatting Made Simple! DESIGN UNIVERSE E-Pen&Write is highly intuitive. It converts notes into text in the same order as they appear on your paper, so if you add a word later, E-Pen&Write recognizes the position of the new item and inserts it into the proper place. With the new selection tool, you can choose exactly which notes to convert to text—from a single letter to a large block of text. E-Pen&Write converts text into many languages. Partial list of languages available: English, German, French, Italian, Spanish, and Scandinavian. If a word isn't recognized it will display in red, and the spellchecker is automatically opened. Selecting only a portion of your written text or drawing is easy. For example, circle an interesting area, mark the desired services, then mark the "Send" box on the paper with “Mail,” and the information will be sent as e-mail. Click the "Recognize" button on the paper form, and your handwritten notes appear in your electronic forms and calendar exactly the way you've written them—text and/or drawings. Transmit handwritten messages and 2D sketches as well as e-mail, SMS, or fax messages. Need more room to write? Switch to A4 page format whenever needed. "Edit note" feature lets you add words whenever needed. Or open the paint tool feature for drawing or altering geometric shapes. Delete and Undo features make changing your text easy. Change the pen stroke's color or width, or even change the interface color as needed. Copy or print any document. Send notes by e-mail, or as Word documents. Export notes as jpeg graphics files. Export notes to Word or any Microsoft Office program. Save work to a specific folder directly from the paper to your computer.